Last year, I only set 4 simple goals. Mostly, because I knew that there’s no way I could have a Year of Rest and have a long list of goals. 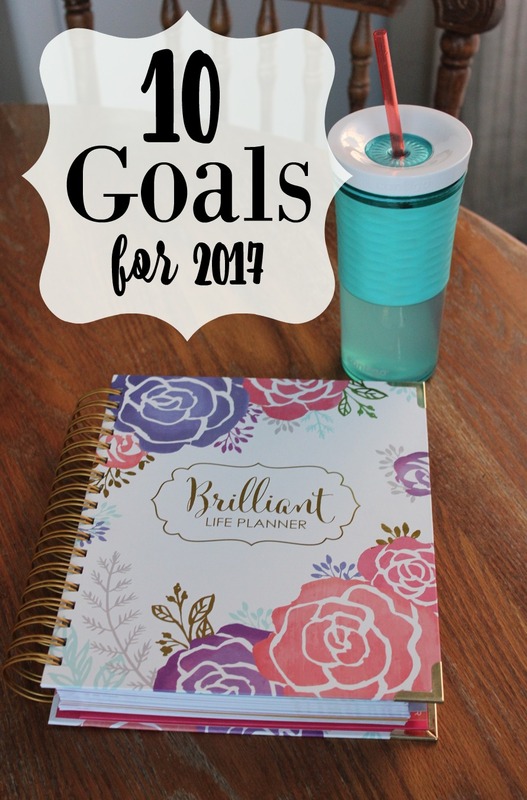 It was good for me, but I am so ready to get back to more formal goal-setting and to get back to our Monthly Goal-Setting Updates here. I’ve missed those! 1. Run 3 miles in 30 minutes — I took up running again this year — as part of my fitness plan that my nutritionist put together for me. I’ve never been skilled in the running department, but I’ve started to really enjoy it and am wanting to push myself here and be able to easily run 3 miles in 30 minutes. Right now, I can run a 10-minute mile, but it’s really pushing myself. So we’re working on building up my endurance so that running a 10-minute mile is simple! 2. Make it to Phase 4 of the nutrition plan — I’m currently almost finished with Phase 2 and am so excited to start Phase 3. My nutritionist says that I’ll feel 10 times better than I feel now when I hit Phase 3. It’s hard for me to even imagine that since I feel SO amazing now, but he’s been right about pretty much everything else so far on this program, so I’m going to trust him! He thinks that at the rate I’m going and progressing, I’ll be able to start Phase 4 by mid-2017! And I guess that when I hit Phase 4, I’ll feel absolutely and utterly amazing! 3. 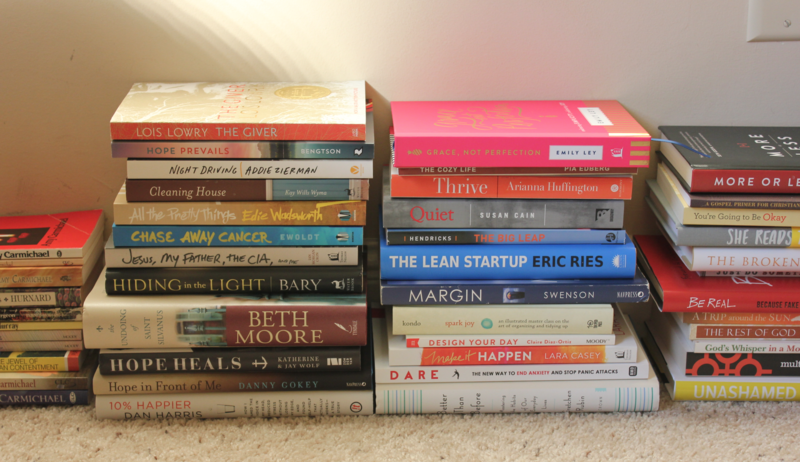 Read 48 books I already own — I didn’t read as much in 2016 nor did I set any reading goals because I let myself have a lot more time to rest, feel, think, process, sleep, and just slowly go through one or two books at time. I wanted to see what that felt like… and I realized it was good for a year, but now I’m anxious to get back to more reading and having a few books going at once! I decided to challenge myself this year to focus on reading books I already own. 4. Go on a 4-day completely unplugged trip — Jesse and I went to Hawaii earlier this year and it was downright incredible. I left my computer at home and didn’t get online or on social media the entire time. It was BLISS!! We walked for miles on the beach, I fell in love with the ocean, I read 10 books (! ), we scouted out the cheapest food options (because the food is SO $$ there! But never fail, we found a Subway we could walk to a few miles away from our hotel! ), and we just had so much fun together. 6. Sell our 3 rental houses in Kansas — So, we loved having rental houses and it’s been a great investment for us (we paid cash for them and have turned a profit on them pretty much every single month we’ve had them! ), but we have decided that we’d like to sell them (and hopefully turn an additional profit when we sell them) and put that money into our house savings. Then, once we’ve purchased a house here, we’ll start saving to invest in local real estate. 7. Save up to pay cash for a house here in TN — As I mentioned above, this is something we’ve been mulling over a lot this past year and thinking through and have decided to start saving aggressively for in 2017. We currently have around 15% of the total amount we’d like to save set aside in our house savings fund. By selling our rental houses, we should have about 75% of the total amount saved… which will mean, we should be able to save the additional 25% needed this year if we careful and strategic. And yes, homes in this area are much more expensive than Kansas!! We could move about 30 minutes away and homes would go down significantly in price, but we love this area and we love being so close to our church, to the kids’ school, and to other places we go to on a weekly basis. We’ve also decided we’d like to buy something that would be our “forever home” and would give us enough space to have offices + bedrooms for each of the kids. 8. Release 2 courses — We have plans in the works for me to release two full-fledged courses on two different topics. More coming on that in the next 3-6 months! 9. Start 3 new blogs — More on this coming on Monday! I can’t wait to tell you all about what’s coming and what’s changing here. And I promise I haven’t up and lost my mind… this is something that we’ve spent a lot of time talking through and sitting on and making sure was not over-committing. I think when I explain it all, it will make sense to you, too — and I hope you’re excited about it like I am! I decided to choose two very specific habits I want to work on in 2017. Both of these are ones that will make a big impact on our home and family for me to be consistent with. I’m going to use the habit tracker at the back of to keep tabs on my daily progress on these. I think this system will really encourage me to make this a priority! More compartmentalized work schedule — This is one way that I’m saying “yes” to my family. I’ve done a lot better this year at having a compartmentalized work schedule, but I want to get even better at it in 2017. Which is why I’m putting it out here and making it a habit I’m tracking every single day. My official work times starting on Monday will be: 9 a.m. to 3 p.m. = Work Time, 3 p.m. to 8 p.m. is Unplugged Family Time. We’ll see how this goes! What are YOUR goals for 2017? Tell us in the comments! Do you need some motivation to make your health a priority in 2017? I have a passion to help you become your best self. I don’t want you to go through life feeling exhausted and burnt out. I don’t want you to have to rely upon coffee or coping mechanisms to make it through the day! I want to help you prioritize your health, boost your energy, and set realistic goals for self-care. Join me for the 15 Days to a Healthier You Program — registration ends in just a few days! Sign up here. As a fellow runner I just wanted to provide encouragement. I remember a time when I could not run a mile without stopping and now I am training for my first marathon in March. You will get there! When a run gets tough I focus on my running mantra: “but those who hope in the Lord will renew their strength. They will soar on wings like eagles; they will run and not grow weary, they will walk and not be faint” Isaiah 40:31. It really works, at one point I would write the chapter and verse on the top of my running shoes so I would see it each time I got tired. Good luck on this and all your other goals for 2017. Thank you so much for your encouragement! I really appreciate it! And WAY TO GO on training for a marathon! I’ve been looking forward to reading it!! Send me an email: crystal @ moneysavingmom.com — I’m happy to share more information! Good luck on selling and saving! That’s very exciting for you I know. 🙂 I’m also excited you’re going away on a fun trip with Jesse. How awesome for you to invest in your marriage. This post may help you with the saving money on a four day trip idea. Katie put up a post about How to Use an Instant Pot in a Hotel Room. Great goals! Be sure to use a travel agent to plan your vacations with Jesse. Their services are completely free. We support your small business, I hope you would do so in return. My 3 goals this year are to earn a full time income blogging, use the money to pay down our mortgage, and learn to embrace the crazy life we have right now. I am so excited to hear more about your new blogs! This kind of specific goal setting doesn’t always work for me but I’ve developed methods that do. Right now I’m working through Susannah Conway’s Unravel Your Year and Find Your Word courses () so I’ll see what I come up with. 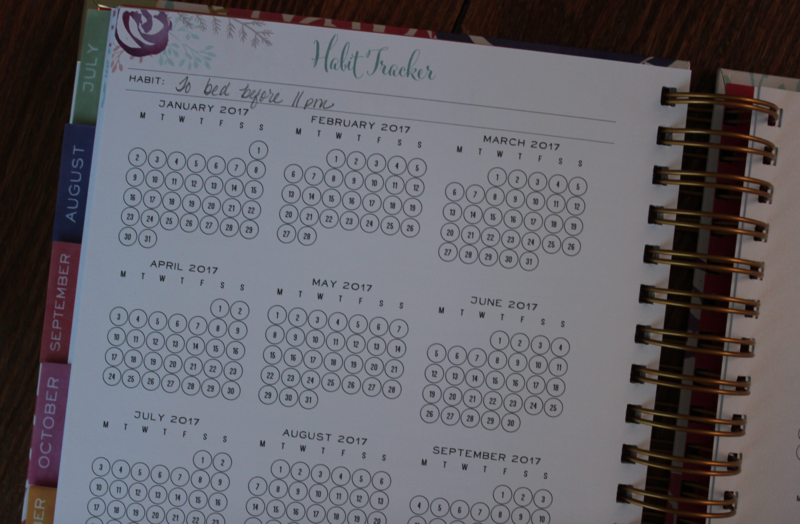 It’s freaky how I ended up meeting – and exceeding – most of my goals from last year but not at all in the way I thought! I’m a bit at a loss for 2017 because we have big changes happening our family. On January 3 I’m starting a new job and a new career in which I’ll work significantly more hours per week than I have in the past decade. My husband is also in a big career transition which brings fairly dramatic changes as well. Everything from our daily schedules and commute to our mortgage, health insurance, and retirement savings will be different. Very exciting but since we’re not actually sure how things are going to play out we don’t know how to set goals or plan. Same with my job. I have an idea what kind of goals to set but I won’t know until I get into the nitty gritty of things. The good news is I’m invigorated by the challenges this new phase of our lives will bring. This year I decided I need at least a month to get my bearings and figure out what to work towards. Regular journaling, both personal and professional, will be crucial this year so that’s my one goal so far. But for January my focus will be on just keeping things running with the family (basic household management and relationships) while we all adjust to our new life. I’m looking forward to hearing more about your trip budget (specifically how your Hawaii trip cost only a few hundred dollars) and your new nutrition plan (like if it has a published name, or is it specific just to your nutritionist). I hope you’ll share! I second this…would love to know how you did Hawaii on a couple hundred dollars. I am sure using all her hotel points and airline miles…they add up every quickly especially considering all the travel she posts about. Yes, that’s what it was! We got our hotel and flights for free. We almost always stay in the same hotel chain and use the same airline when we travel (for work or personal) + we have status with both (which means we get extra points) and it really pays off! So our only expenses were for food + transportation from the airport to the hotel — and we did those as inexpensively as possible. I highly, highly recommend that if you travel at all (and especially if you or someone in your family travels for work), that you look into points programs for hotels and airlines. If you are strategic in how you “work the system” with these, it can really pay off over the long haul! That’s what I was going to ask! Good for you on your health journey! There’s no way I could give up coffee (or chocolate), but I’m learning to enjoy them in moderation. 2017 is going to be a great year for physical health! I ran my first 5k this past September and I love how I felt. My goal for 2017 is to run 4 of them, one per quarter! You can do this! My word for 2017 is health, I am going to use “choose health” as a basis for my goal setting. This applies to physical, emotional, relationship & financial health. Not exactly sure what the specific goals are in each category yet, I am actually taking tomorrow to review the notes I made & journaling I did during your 15 Days to a Healthier You series & get my goals set. I really loved that series! It changed me for the better in many ways & I can’t wait to review it again. I love reading your goals for 2017. My goals are to limit my time on social media, lose 20 lbs (I signed up for your course! ), be consistent in spending time in the Word every day, work on writing more compelling content for my blog and simplify my schedule. You are going to rock your 3 mile goal. And you have no shortage of options for 5k races should you decide to run one. Downtown Franklin seems to host them all the time! I hear you on the house cost. It’s expensive, but we love Middle Tennessee. I’m so glad you do too! I met my 2016 goal of learning how to knit socks! I just cast on my 9th pair this evening. I have made socks with traditional heels for me and tube socks that will accommodate my kids’ growing feet. I also learned how to knit cables, short rows and a few other techniques. In 2017, I want to learn how to read knitting charts because so far they stymie me. Because after understanding charts, I want to learn Fair Isle and do more with lace knitting, but most of those are in charts rather than written out. I wish I could run a mile. I have exercise-induced asthma and asthma that is triggered by respiratory infections. I can walk miles but not run them. I am sharing a link of a video I made of some of my goals for 2017. Thanks to your book, Say No to Survival Mode, I have taken one chapter at a time and created these goals! Home: declutter the home…less is more is my new motto for 2017; I’m also trying the 10 item wardrobe! Thank you for your mission in helping people! We are blessed by your work! I really like your goals and habits list for 2017. Keep Pushing even though I don’t have any support and most people we know think blogging is easy and requires no work, yet they always want my support for whatever they are doing or selling and I always do. Keep Pushing even though I don’t have any support and most people we know think blogging is easy and requires no work, yet they always want my support for whatever they are doing or selling and I always gladly do. Live, Love and make darn sure to Laugh! 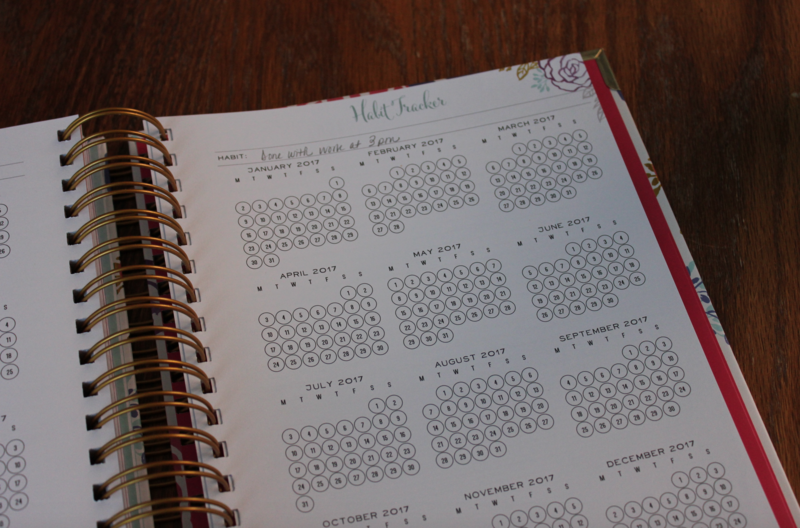 This was great to read- and fun to see that you’re using the Brilliant Life Planner too- I just bought this too after using the SAME boring planner for at least 8 years. I’m still getting the hang of how I want to use it. I like how you’ve gotten clear on different areas of life. I’ve put all of my focus on my business goals so this is a good reminder to set goals in other areas of life too- thank you! As a fellow runner your #1 goal makes me smile! You probably already know this but one of the best ways to build endurance to run longer faster is wind sprints in the last 5 minutes or so of your run. I love #4. I think my husband and I are going to need to do that too after 5 1/2 months on the road with two teenagers and a full grown child in a RV. WOW! To number 9. I know you can do it with a great team though. My goals for the year are very simple since I want to fully SOAK up the trip. That is so cool to hear about your goal to go back to South Africa! Where did you go before? I have been 4 times! The Wild Coast is amazing. My goal for this year is to just stay put and decide what I want to do for school! I’m excited to learn about your new blogs! I want to be more persistent with my blog, my writing work, and my parenting…and maybe even more persistent with washing my face! Persistent is my word for 2017. I do monthly goals so here are mine for January as well as a look over how December went for me. Wow, that is a lot! 2016 was a difficult one for my family. It started out great and I had a lot of ambitious resolutions that I stuck with, but then my family faced some tough times. One by one a number of supports seemed knocked out from under us. I knew God was telling me to pull back some of my ambitions and focus on loving the people closest to me. This year, I have just one goal apart from loving my husband and kids better – learn to play the piano! I am super excited about it, and have lessons lined up. Other than that, I really plan a year of rest like your 2016, Crystal. I was too focused on performing for the world at the beginning of last year. I was too caught up in projecting that “perfect” image and doing a lot for others outside my home. This year, I am withdrawing a little 😉 Good luck with your goals, I am excited to see what changes you have coming! I am a stay at home mom/homemaker…. 3: Meal planning and sticking with it! So do you think you’ll only be working 9 to 3 weekdays or will you do some extra on nights and weekends? It’s amazing how much you accomplish in that time! I’m really trying to commit to less work hours in 2017 and have more time completely unplugged. My kids are only little once, and I really don’t want to miss much of it because my mind is always in “work mode.” Since having baby #2 this summer and watching my daughter turn 2 I’ve realized how fast time goes and I’ve gotten better about spending more quality time with them even if it means sometimes disappointing my customers or readers – even though that’s super hard for a people pleaser like myself. Love this, Crystal! I’ve really enjoyed following you this year, and look forward to more from you in 2017. Blessings to you, Jesse, and your family! I love these goals! Will and I are away for a couple days on a retreat together next week, and I hope to make mine then! YAY on the goal for the house!! I’m so excited for y’all!!! HAPPY NEW YEAR!!! I love all of this! I have this planner and wasn’t sure how to use the Habit Tracker. Thanks for the inspiration! Happy New Year & good luck conquering your goals in 2017. Hubby and I are closing our house (our first!) in a matter of weeks, so that will open a new chapter in my life. I’ve never been good at decorating (mostly due to fear of what other people think 🙁 so I need to really work on that. Mostly it’s about habits, of which I am a HUGE fan. One change: limiting social media use to my work hours. I removed apps from my phone to help me with this. Also implementing a “Family fun hour” – with older teens and so many going in different directions, it’s a challenge for us to spend an hour together weekly as a family! Would you mind sharing the process you and Jesse are using for determining criteria of needs/wants for your new house? The current house you are renting is adorable, but it will be exciting to see you and your family find your “forever home”! And I’m surprised about the goal wanting to sell all current 3 rental properties? What has changed that prompted wanting to sell all your rental (100% paid for, positive cash flow) properties? You will typically see greater returns on properties you’ve held for awhile. But if it’s just for closer location, have you considered a 1031 exchange (which would defer any capital gains tax due)? You will spend $$ through realtor commissions & capital gains taxes, so please make sure your plan is well thought out! Thanks to your post, I bit the bullet and started writing a blog! I love that one of your goals is to go to South Africa again! As an international traveler, I cant wait to travel again. Hubby and I are pausing to adopt a baby. If you would like to see our journey, feel free to drop by. I always love your goal posts! I have a number of goals this year including 30 minutes of exercise a day. I’m fine with 3, 10 minute sessions, 2 15 minute sessions or the 30 all at once. I just want to get moving everyday! A bullet journal doesn’t have to be fancy at all. I just use the same pen & my normal handwriting but it’s still very helpful in tracking & planning my life & seeing where I’ve been. I actually feel the same way about Bullet Journals. I know that if I took lots of time, I could come up with some fun stuff, but I already find it way too easy to take so long making a list that I don’t have time to get up and DO the list. And I think having to draw out my calendars and things would make me procrastinate, and then the journal would just sit empty. Great goals, and I’m looking forward to seeing how things work out for you in this new year! I have always used a physical planner to keep track of stuff, in addition to Google Calendar, because I really like having something physical to write in. This year a new goal was to upgrade to a goal setting planner to do more than just keep track. I purchased the Passion Planner, and sat down yesterday to start mind-mapping and goal setting. At first I thought it would be really overwhelming, but I’m liking it a lot, and think this will help me FOCUS, which is my word for the year! 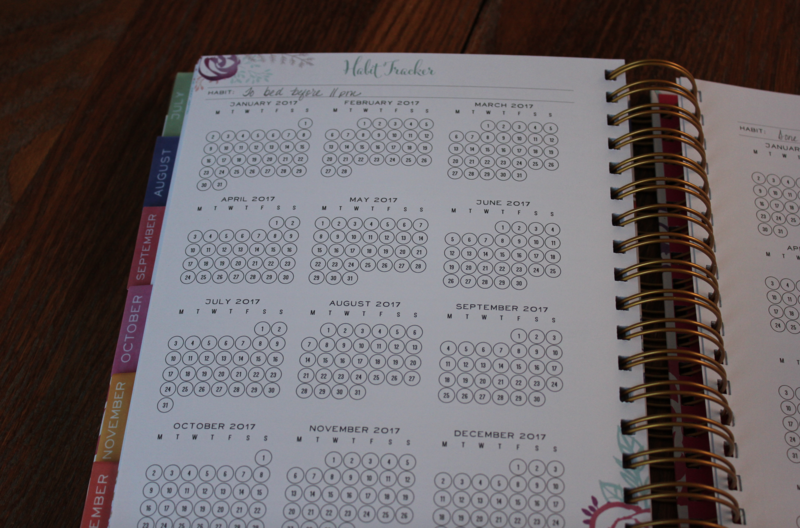 Thanks so much for sharing about the Passion Planner! Well, I am challenged to work on my goals starting this week. I feel a little behind everyone else (or so it seems), but in my house the Christmas season is just barely ending and our tree won’t come down until this weekend. It was a busy but good Christmas with family visiting, but we needed the rest of last week as mostly down time. So this week I will start to make more specific plans for the new year. One thing I’ve struggled with I guess for my whole life is getting to bed at a decent time. I’ve tried and worked on it some, but have failed to make it a better habit. Now that I’m working a part-time job that I like (since the last two years have been changes and transitional jobs), my hope is to create a more intentional schedule and goals. Getting to bed earlier will be at the top of my list. LOVE the Brilliant Life Planner (and strongly considered buying it), but I think I would do well to use a free one that was part of a bundle I purchased in 2016 for now. Using a planner is another habit I wish to work on. Maybe you touched on this in another post, but I am AMAZED that you plan to read 48 books in a year. That, according to my figures, is about one book/week. An average book has probably 10 chapters. That is more than a chapter/day. How do you manage that? Are you a speed reader, do you have an hour/day set aside for reading, or what is your secret? Ha! I usually read at least 70 to 90+ books, so 48 isn’t actually very ambitious for me. 🙂 I love to read, so that helps! And then I try to find at least another time either one night or on the weekends when I can fit in another hour of reading. Between all of this, I can easily get through an average of at least 1-2 chapters of a book every day. It’s all about just making it a priority and finding pockets of time for it and then making it a habit. It’s funny, even before I read your post this year, I wanted to differentiate between my goals that I wanted to set for this year, and the habits I wanted to develop or maintain. Last year, I set 25 goals and achieved half of them (and I had habits mixed with with goals), this year I’m setting just 5 goals, and then I will strive to maintain 2 habits. It’s doable, and I like it!